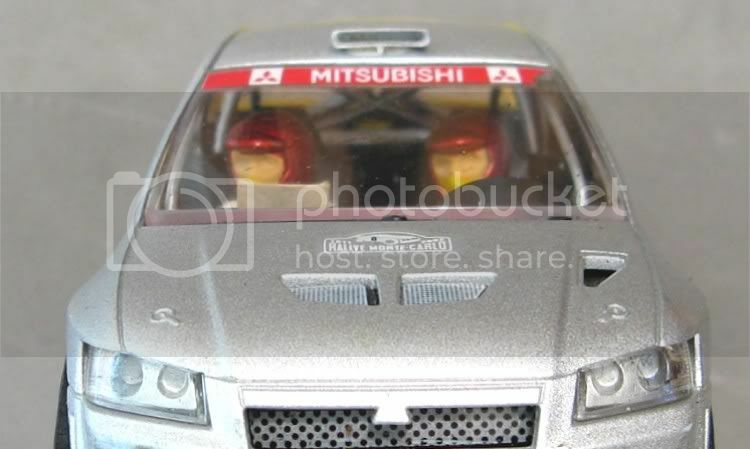 I took this model out of the race box a week or two ago to test it for an up coming competition. Group 1 Rally, which in simple terms means a rally car propelled by an NC1 or an NC8 (Ninco) motor. I made it about four years ago and while I was race prepping it I realised I hadn’t done a ‘how to’ on the Outhouse, so without further ado, I have quickly assembled this little piece of information. I make no excuses for the condition of the model. I can only say it did get a bit of a cleanup and lube job as the review progressed. The model has accumulated a series of proud battle scares and these will be in evidence in the photos. The model usually gets ‘outed’ occasionally at the Red Team evenings which briefly means it isn’t driven to the max, and as the competition isn’t too stiff it can usually get a first past the post when required. Another good thing was that while racing it at the Red Team, I have slowly identified and rectified all those little things which can let you down in full on competition. I have often said that you can race alone at home ‘til you’re blue in the face, but you will never duplicate the cut and thrust of full on competition, and consequently, when the time comes to pit your talent and set up skills against the best in the club, you find that either yourself or the model are suddenly wanting. So, in the first instant I needed to put the model together in a layout which is competitive. 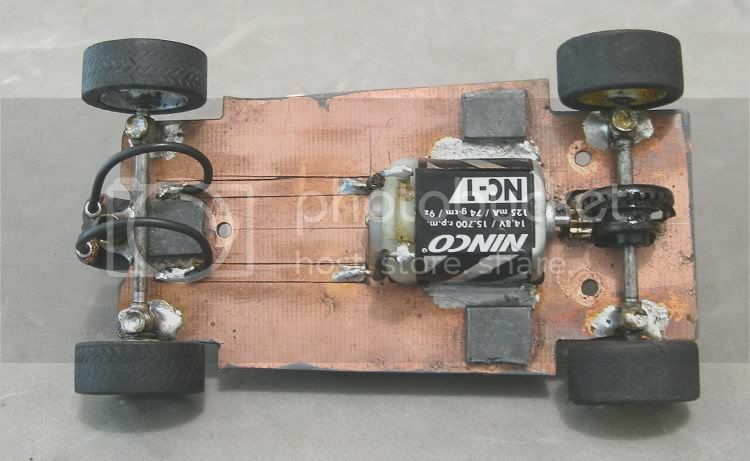 The pre requisites were a flat chassis low to the ground and other features already tried and tested in RTR models. The motor is specified in the class rules so that was a simple decision. 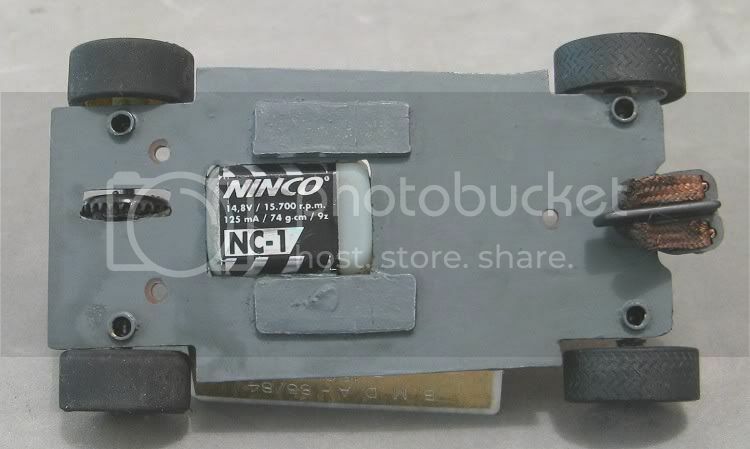 Since making the model the Ninco N8 motor has been released. Had it been available I would have chosen this motor as it has a little more torque and some useful extra dynamic braking features than the NC1. Because of the weight of the copper sided PCB I decided that the chassis would not go from front to rear as others had. I chose to cut the original plastic chassis ends off and glue them in place. Even though there would be ballasting later, I would be in control of where it was going. Too much weight in front of the guide will cause the model to waggle its tail as it tries to overcome the weight. Too much weight behind the rear axle will leave the model with a pendulum type effect when cornering and exiting corners. An ideal set up is to have all the model weight between the front and rear wheels. This is not usually achievable, so the next best thing is to have those bits of model which sit out front and back as light as possible. The axle mounts are the Wixwacing standard mounts where a vertical tube is cross drilled and the horizontal axle tubes are soldered into place. The soldering doesn’t take place though until the body and guide are mounted and the model’s standing height can be established. This will all so require the wheels and tyres to be chosen and mounted in the axle tubes. Once the chassis is built and the guide is mounted, the position of the driver’s tray can be established. Being a Hornby kit, the interior is exactly the same as the Scalextric slotcar, this means the drivers tray clips into the body along with the clear parts. So, after clipping the unaltered tray in place, the chassis complete with motor soldered in place, can be offered up. The most obvious problem is that the motor will foul the tray. Some careful measuring and some careful dremmelling had the tray cut open to let the motor poke through. The tray was then placed over the chassis and some thin plastic card was cut and glued in place to enclose the motor. This needed to be done as closely as possible. Once in place, the driver and co driver, along with the seats and other interior bits needed to be trimmed until they fitted tidily on the drivers tray. I decided not to take the lead wires to the motor as the body tray and chassis clearance were minimal and getting wires under them looked daunting. In this case I decided to score a couple of tracks in the PCB surface. This allowed me to attach the guide lead wires to the front of the chassis. The rear lead wires could then pick up the power on the tracks at the rear, avoiding having to find a home for the wires, especially every time the body is removed and replaced. This is something I have used regularly since with great effect. The drivers are Fly open face drivers, still available as spares from several sources internationally. After everything was fitting well, painting had to be done. I did a simple and distinctive Wixwacing livery for this model in acrylic. 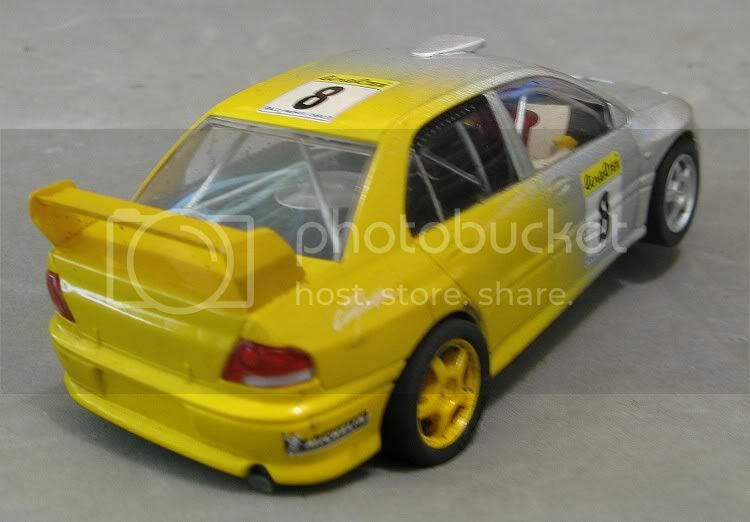 The body was initially primed with Tamiya ‘neutral grey’ and after a couple of rub backs the yellow was applied. Again, after a good break to allow the paint to cure, the silver coat was applied. This was applied diagonally down the side and the silver was allowed to overlap the yellow causing the two colours to fade into each other. After the first coat of clear was applied the decals were applied. The model then had a second coat of clear and was left for a few days. There was more body handling to be done and if the paint hasn’t had time to harden you will leave fingerprints in it! The kit comes with tyres and these were used initially, but the rears were changed for SCX type sevens after some track testing. The guide is a Ninco sprung guide and there was allowance made in the length of the guide tube to allow the spring to function. The body was mounted on three posts. These were made from polystyrene tubing which I sourced from the local hobby store and I used some very nice ‘2 gauge’ screws with ‘in hex’ heads as body screws. The posts were fitted to the chassis and the chassis was offered into the body to test their lengths. The posts were carefully trimmed until the chassis sat tidily in the body. The body ends of the posts were scored, along with their locations inside the body. Super strength epoxy was mixed and applied liberally to the post ends and the body. The chassis was then placed in the inverted body. To get wheel and arch placement accurately matched I used four strips of card. These were wrapped once around each tyre and formed a spacer between the tyres and wheel arches. This was left for twenty four hours without disturbing it to ensure a good bond. So with the body and chassis mated together, the next task was to go for a road test. Once on the Red Team track it was plain to see that the model was fond of standing on two outside tyres in the tighter corners. I placed some lead either side of the motor and behind the guide. This was a great improvement. During its early races, and due to the high body weight, the model still showed a tendency to run up on two wheels when pushed hard. I rounded the outer edges of the tyres and reduced the effective tread width which helped greatly. The final measure some weeks later was to increase the ballast on the underside of the chassis. This was a final fix and the model was predictable on most circuits it has been raced on. I never expected this model to be a race winner, but race winner it is in the face of lesser competition. The process of running the model and modifying it probably lasted for a couple of years as it hadn’t been raced that much. I eventually reached the position where the model was great fun to drive in most non magnet situations, and eventually I managed to get a fourth place recently in very stiff competition and against NC8’s. Am I happy, you bet! I don’t feel the necessity to develop this model anymore as I already have models capable of winning this class!! I just get so much more satisfaction racing a home made model to a good placing! And that, to me, is what the hobby is about!! 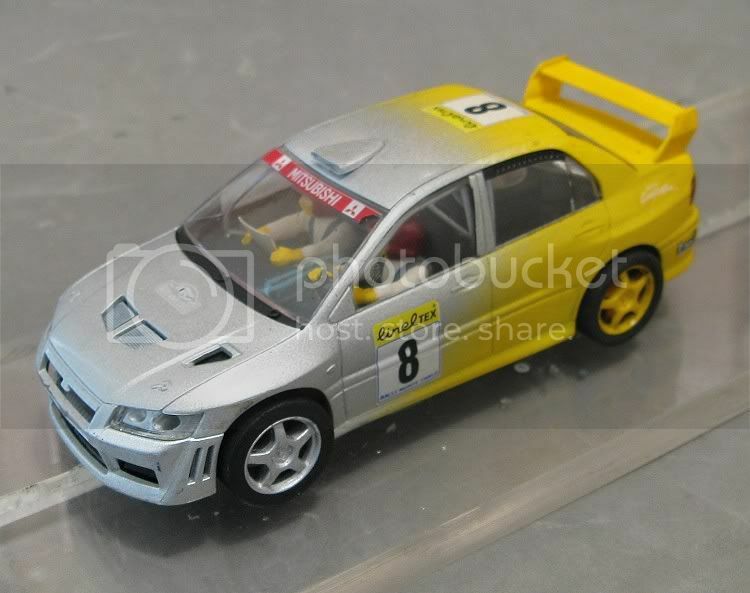 So if your building bench is empty at the moment, seek out one of the Hornby kits, I believe there was also a Subaru and a Focus, and get to work on your next slotcar experience. You won’t regret it! 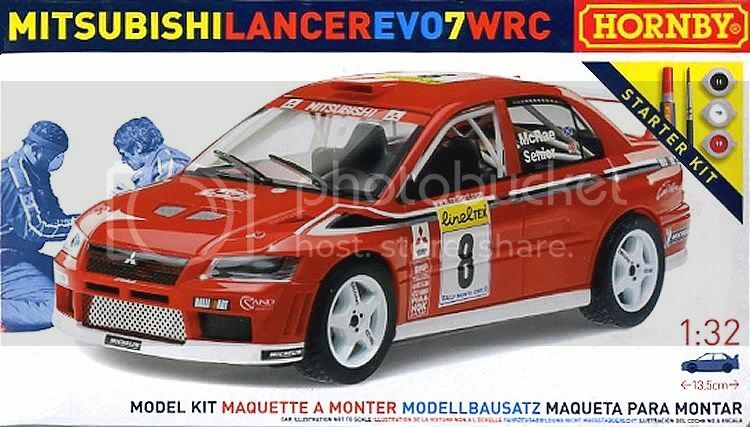 Looking for an EVO 7 ,click here!